Be the first to share your favorite memory, photo or story of Mildred "Toots". This memorial page is dedicated for family, friends and future generations to celebrate the life of their loved one. 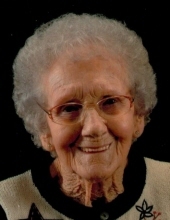 Mildred “Toots” Campbell Crist, 93, of Hico, WV passed away on Monday, Feb. 5, 2019 at Hubbard Hospice House, Charleston, WV. Born June 29, 1925 at Landisburg to the late William Alva Campbell and the late Ora Gladys Phillips Campbell. Mildred was member of Sunday Road Baptist Church, Hico, WV where she loved her church family and was always eager to help those in need. She loved to cook, sew, and take care of her family. A lifelong resident of Fayette County, in later years she came to Kanawha County to live with her daughter and reside at Eastbrook Center. Besides her parents she is preceded in death by her husband, L. Dennis Crist; an infant son and daughter; and half-brother, James Treadway. She is survived by her daughter, Brenda Crist Sedlock ( John Russell); grandchildren Andrea Beth Sedlock (Andy Willams), Kristen Denise Sedlock (Christopher Eplin); great grandchildren Jaiden Hott and Paxton Eplin; special nephew Jimmy Treadway. Services will be Saturday, February 9, 2019 at 2:00 PM at Sunday Road Baptist Church, Hico, WV with the Rev. Allen Donaldson officiating. Burial will follow at Kesler Memorial Presbyterian Church cemetery. In lieu of flowers, donations of sympathy may be made to Hubbard Hospice House or Sunday Rd Baptist Church. The family wishes to thank the staff of Eastbrook Center and Hubbard Hospice House for their exceptional care. Wallace & Wallace of Ansted are in charge of arrangements. To send flowers or a remembrance gift to the family of Mildred "Toots" Campbell Crist, please visit our Tribute Store. "Email Address" would like to share the life celebration of Mildred "Toots" Campbell Crist. Click on the "link" to go to share a favorite memory or leave a condolence message for the family.